Ospreys flanker Justin Tipuric is out of Wales' summer tour of South Africa, his region have confirmed. 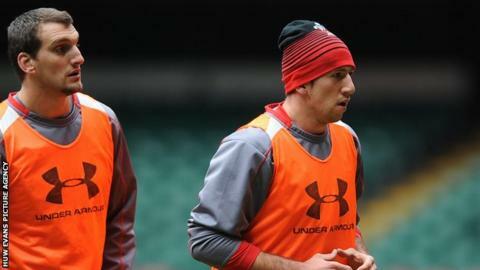 It means Wales will be without two front-line open-sides, with Sam Warburton also missing. British and Irish Lions forward Tipuric is to have shoulder surgery next week, while 2013 Lions skipper Warburton has already been ruled out of the two-Test tour by shoulder problems. Tipuric will play for Ospreys against Connacht in the Pro12 on Saturday. Fellow Wales internationals Ashley Beck and James King will also undergo surgery next week. Back-five forward King will be out for up to four months, also ruling him out of contention for the two-Test tour while centre Beck hopes to clear up a long-standing hip condition. Wales coach Warren Gatland was aware of Tipuric's shoulder trouble in April. And at the first Wales senior trial for 14 years on Friday, 30 May, Gatland and his fellow coaches and selectors will have the chance to assess players with the potential to face the Springboks at open-side. However, Dan Lydiate could be involved with Racing Metro if they reach France's Top 14 final on 31 May. Racing Metro's bid to do so begins at Toulouse in a play-off on Friday, 9 May. When he revealed the 24-year-old may need surgery, Gatland said he would consider other options in the event of the player withdrawing, including Lydiate and Cardiff Blues lock Bradley Davies. "We've got other options because I think South Africa is a team you can play against - because of the size of the players they pick in their back-row - without a specialist open-side," said Gatland on 17 April. Tipuric has been Warburton's rival for the Wales open-side berth for the last two years. Gatland is ready to select a giant Wales back row to combat the Springboks trio of number eight Duane Vermeulen and flankers Willem Alberts and Francois Louw. "We could shift Dan from blind-side to open-side and bring in Bradley at number six to deal with Alberts," said Gatland. "It's certainly something we are exploring." Warburton injured his shoulder in Wales' 51-3 win over Scotland in the final game of the Six Nations, while full-back Leigh Halfpenny dislocated his shoulder in the 29-18 defeat by England at Twickenham.